Coffee can be the Holy Grail for some people. Some of us can’t start our day properly without a good cup of coffee. Other people for example, they just love other presentation of coffee, like iced coffee or Frappuccino. But in the end it does not matter if you prefer your coffee hot, cold, sweet or bitter, it is an undeniable truth that coffee can stain your teeth pretty badly if you let it. And I want to start by speaking about this because most patients just ignore this fact. At least it is worth to know why coffee stains your teeth in the first place. Some even call that particular discoloration “coffee smile”, so I feel like I have the duty to let you know why this occurs. We can start by talking about the tooth enamel. This is a coat that covers each tooth and is hard and tough as hell. This doesn’t mean that it is flat too like some of you may think, on the contrary the have m icroscopic pits that can serve as a place to accumulate food debris or like this case coffee and such. This is a perfect environment to set the pigments of colorants contained in food and drinks. And because we are speaking about coffee, the stains can be permanent if we don’t take the appropriate measures un time. And that is what I’m going to teach you in a bit, keep reading and all your answer will be answered. 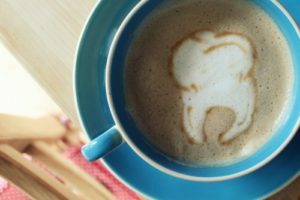 A common question is that if adding cream or milk to the coffee help to mitigate the effect of the discoloration of our teeth. The answer is no, this not help your smile at all, it does not prevent the coffee smile not even one bit. How to prevent coffee smile? The most effective solution to this is to cut coffee from your diet forever. But you and I both know that isn’t going to happen, coffee it’s just too good! So one valid suggestion is to cut its consumption down a little at least. Dentists in Los Algodones also suggest drinking one cup of coffee a day is more than enough to take advantages from its effects. So if you are a coffee freak, turn it down a notch. This means that your teeth will be better if you drink your coffee in a specific time of the day rather than sipping your cup through all of the day. And of course, brushing your teeth and rinsing it with water or mouthwash will help a ton to prevent the coffee smile. How to fix coffee stained teeth? This answer is pretty straight forward. You have many options out there in the market. There is so many whitening products that can return your smile to the state you always wanted. But you have to be careful with some of this product because they contain so much chemicals that can end up ruining your tooth enamel in the long run. One golden tip is to always seek for products that have the ADA seal of approval. My personal favorite product for whitening my teeth is the toothpaste because it is the less abrasive, I think. Even so, I recommend to be really careful going for this route. The best advice I can give you to fix the coffee smile is to see a dentist! Honestly, they have the knowledge and the best tools to clean your teeth. You can even choose to get whitening with laser, white smile in minutes! So don’t be shy and stingy and book an appointment with your dentist twice a year for regular checkups and cleaning. And while you are at it, choose Dental Solutions Los Algodones for excellent prices!